Earlier this month we brought news of Elite Systems‘ initiative to expand on their ongoing retro rebirth efforts and bring a host of classics of old to iOS — those that originated on platforms beyond the ZX Spectrum, which was their initial source platform. Studio co-founder Steve Wilcox was kind enough to provide us with builds of the first wave of titles that will soon arrive in the Elite Collection of 8-bit home computer games to share with our readers. 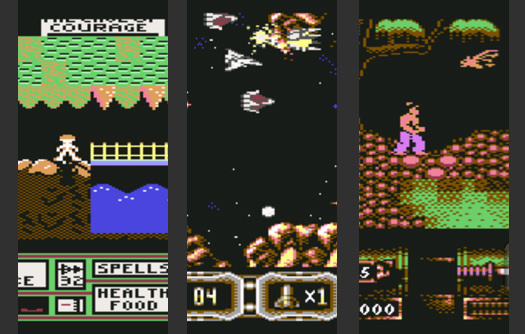 The first Elite Collection titles that will arrive in the App Store are Datasoft’s 1987 magical platformer Black Magic, Image Works’ lovely 1992 release First Samurai, and the frantic 1992 space shooter Enforcer from Manfred Trenz. Every one of these titles is very well implemented in iOS and is among the top tier of games to be found on the 8-bit platforms of decades past. The evil wizard Zahgrim has turned good Aganar to stone. Being a ghastly sort of wizard, Zahgrim has removed his six eyes and placed them in different locations across the land so they may view the destruction being wrought in his name. Your task is to recover each eye and place them, one by one, into the empty sockets of the Blind Statue. Hordes of monters roaming the land make this a challenge, but you’ve got your arrows and magic to aid you, and a bit of help from a somewhat fiendish troll. In researching Black Magic for this post, I found a great many fond recollections gamers shared of hours spent chasing down the six eyes of Zahgrim. The title is very well loved and secured an 8.2 user rating from Lemon64. Enforcer: Fullmetal Megablaster is an excellent side-scrolling space shooter released for the Commodore 64 in 1992. That it is, indeed, excellent should come as no surprise, given that it was written by Mafred Trenz, the developer behind the Turrican series, the C64 version of R-Type, and The Great Giana Sisters. Enforcer features some of the best graphics ever to grace the C64’s screen and the on-screen action is furious and maddeningly difficult. The game features six levels through a range of space and cave backdrops, with an boss waiting at the end of each. It is a very well-received title that has secured an 8.3 user rating on Lemon64. First Samurai, released for the Commodore 64 in 1992, puts you in the shoes of the first samurai in history. You start out as a hermit travelling through an ancient land, but with enough food — and sake — you will grow stronger and stronger, gaining power and eventually becoming a samurai. That is, if the daunting enemy creatures don’t do you in first, which they probably will. First Samurai is, without question, one of the five best looking C64 titles I’ve ever encountered and features very nice platform combat action. Elite’s iOS version features glass-smooth sprite animation and brings a truly worthwhile platformer to our favorite mobile game devices. First Samurai got an 8.3 user ranking at Lemon64. The Elite Collection titles detailed here will be available in both standard (iPhone, iPod touch) and HD (iPad) versions that are playable in both portrait and landscape orientations. (All videos in this post are of the iPad HD versions of the games.) Each title features the latest implementation of Elite’s iDaptive control system, which allows highly customized placement of both virtual joystick and virtual key controls on the game screen, as illustrated in the embedded videos. I am in hopes that Elite will consider the addition of iCade support for all of these titles, to allow for an even more authentic retro game experience. Elite has gathered quite a collection with which to launch their new retro effort, and I must confess it’s been rather painless labor running through these titles in preparation for this post. For the retro fans out there, each of these titles is a no-brainer buy — obviously — but, as I am one who appreciates the simpler formulas of old, I must urge even those without a nostalgic bent to have a close look at the provided videos and consider giving these titles a shake. My crotchety old self is often of the mind that “they don’t make ’em like they used to," when it comes to games I really want to spend time with. This initial Elite offering is a rather good representation of “the best they ever made ’em." And there’s much more of this ilk on the way from the studio. It’s a pretty great time to be a (retro) iOS gamer. We will let readers know when the first three Elite Collection titles go live in the App Store this weekend and will keep the news coming on future titles in the collection, as we hear it.